See the file I am loading. Practice this lesson on the corner curve as used on the small letter 'i'. Notice the 'x' that I put on the first letter as to the way NOT to make the curve. Notice the arrows on the other 4 letters to see the way the curve IS done. I am posting my analysis of the way that Madarasz wrote the word 'ome'. He probably did the 'o' in one stroke. The shade is somewhat darker than as used in other shaded letters (see the third down stoke in the small 'm'). This was an effect the penmen liked to used to even out the dark shade of the capital letter preceding and tie the first letter after that shaded letter for better visual effect. The down shade on the 'o' is wonderful. Look at it with the magnifying glass. It was slowly drawn with his forefinger, no arm movement. After the 'o' Maddy probably lifted the pen and slid the paper to the left to get in the right position to finish the 'm’ and ‘e'. Penmen lifted their pen and slid their paper often (every 3rd letter) so they would maintain the same slant of all the letters on a single line. (If the paper is not moved to the left, the arm will cause a significant change in slant from the beginning of a line to its end). 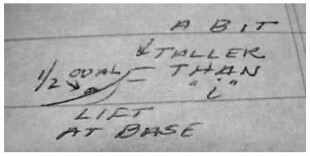 Madarasz wrote the 'm’ and ‘e' with no additional lifts. Notice the lighter shade on the third stroke of the 'm', the equal distance between the two portions of the 'm'. However, he blew it on the low crossing of the small 'e'. He did not get enough lift from the third stroke of the 'm' to get a good corner curve. The crossing of the 'e' at its bottom is too congested. My attempt at this 'ome' is posted with comments. I had to write the letters 22 times before I got it right. 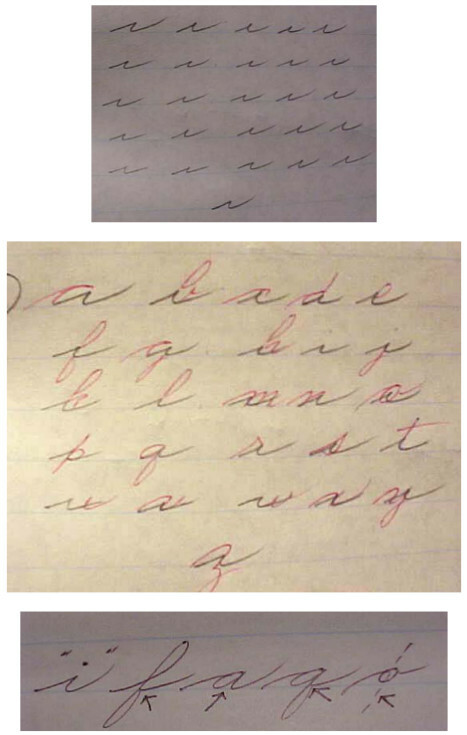 Practice these letters and really get to know the feeling of how Madarasz wrote. The next lesson will be the word 'what', again in detail. Study this letter carefully in the Maddy letter as it is such a unique form. Maddy came up with this form much like an artistic designer would create something new. No one before him had used this lovely style of letter and most viewers would not even notice how it was made. The arm moved the pen to the top of the 's' (a bit higher than a small 'i'). He used finger motion to bring the pen down slowly and cause the down line to disappear into the base line. NOTE: he did not connect the bottom to the upstroke. The 1/2 oval is put on with the pen without a lot of heaviness, just enough to cause the illusion of a closed letter. It is a marvelous letter form. 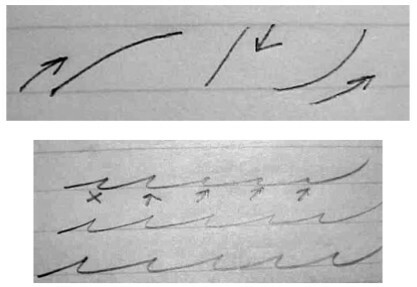 On this word Madarasz lifted his pen 3 times: after the 's', after the second part of the 'b' and also above the cross line of the 'l'. The pen lifts were to preserve slant and accuracy. He used a lot of arm movement between letters but in letters there was precise finger motion. 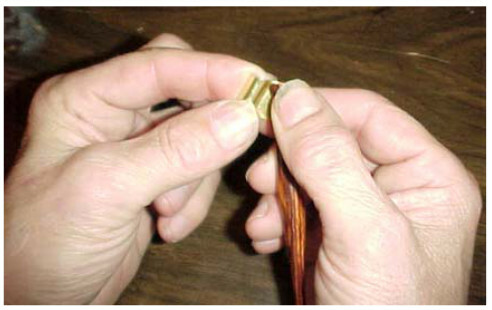 Put the holder in your hand with the right thumb on top. With the left fingers as shown, push up with the lower index finger and down with thumb to bring the oblique up. This will help the nib 'skate' on the surface of the paper rather than dig in. Photo shown in files. The small 's' is higher than the 'i' form; each time Maddy lifted his pen he also slid the paper to the left. Notice the 7 to make the shade on the 't'. 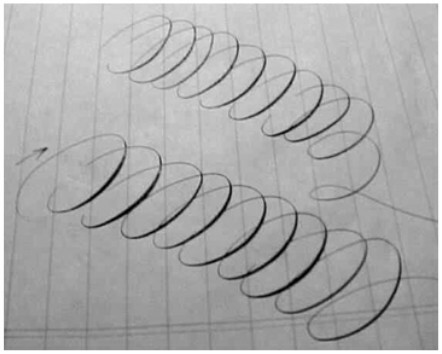 He used the curved end on the 'y' as it was easier than making a precise loop which had to cross exactly on the base line. And the curved end 'y' is just a bit of eye candy. The top of the 't' is just fun. 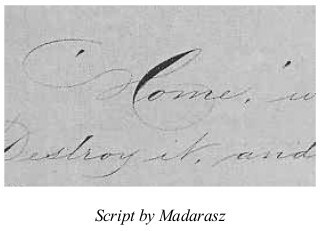 I have made 3 files for Madarasz writing as to how he finished the first line of the full page. Notice the 'x' I used to show where he lifted the pen and also slid the paper to the left. 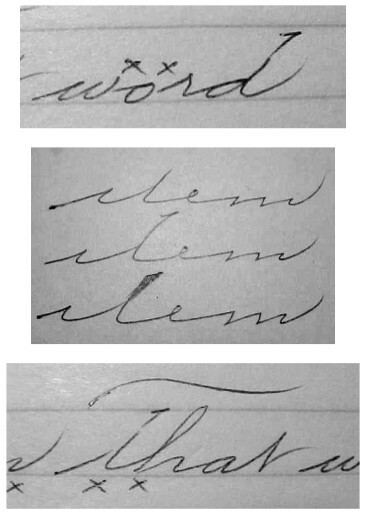 Notice the small 't' and 'd': he often would write to the height of the 'i' in each of those letters, lift the pen, and come down from the top. Note the right side of a figure '7' which is the way he would shade the top: filling the form.